To do this automatically, I have created a Python/Web2Py-based web app: GapDB Gap Checker. 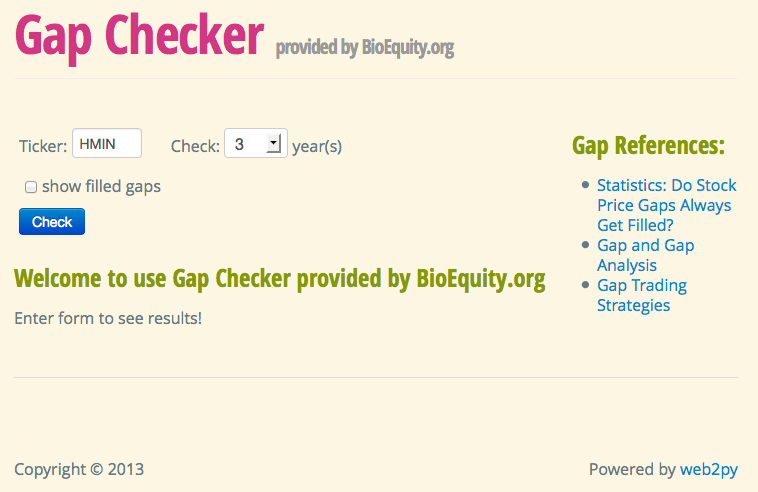 With this app, you will be able to search for unfilled gaps in recent 1, 3, 5, or 10 years. The date when gaps are logged, number of days since created (unfilled), and price of gap will be listed. Historical and current stock prices are pulled from Yahoo Finance. If you are interested in filled gaps, just select the optional checkbox, they will be shown. I am planning to have introduced Fibonacci retracement to help identify key levels. Do you have any suggestion for features? Please feel free to contact me! Historical data are pulled from Yahoo Finance, if your ticker is invalid, please check if Yahoo is using the same ticker and whether its historical data is available from Yahoo. If you are sure ticker is right but still have problem. Try again later. Yahoo Finance service can be unavailable at the moment for your ticker.